In 1887 the journalist Alfred Harmsworth formed a new publishing business. Early publications included Answers (1888) and Comic Cuts (1890) and in 1894 went into newspapers when he acquired the London Evening News for £25,000. Harmsworth revolutionized Fleet Street when he began publishing Britain's first tabloid, Daily Mail in 1896. One of the popular innovations of the Daily Mail was a woman's section that dealt with issues such as fashions and cookery. In 1903 Harmsworth decided to establish the Daily Mirror, a newspaper "for gentlewomen". Kennedy Jones was put in charge of the project and spent £100,000 in publicity, including a gift scheme of gilt and enamel mirrors. 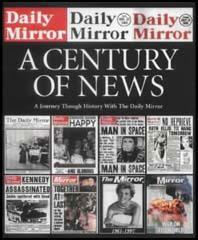 On its first day, the circulation of the Daily Mirror was 276,000. However, sales dropped dramatically after the initial launch and by January, 1904, circulation was down to 24,801 and the newspaper was losing £3,000 a week. Alfred Harmsworth decided to change his original plan. The editor, Mary Howarth, was replaced by Hamilton Fyfe, who changed it to a picture paper for men as well as women. As Harmsworth later recalled: "Some people say that a woman never really knows what she wants. It is certain she knew what she didn't want. She didn't want the Daily Mirror. I then changed the price to a halfpenny, and filled it full of photographs and pictures to see how that would do." Within a month sales had increased sevenfold. Hamilton Fyfe also experimented with using different types of photographs on the front-page. On 2nd April, 1904, the Daily Mirror published a whole page of pictures of Edward VII and his children, Henry, Albert and Mary. This was a great success and Harmsworth now realised the British public had an intense interest in photographs of the Royal Family. Another successful innovation was the sponsorship of special events. In June, 1904, the Daily Mirror paid D. M. Weigal to drive a twenty-horse power Talbot on a 26,000 mile motor run. A month later the newspaper offered a hundred guinea prize for the first person to swim the Channel. In August 1905, the Daily Mirror began to pioneer the idea of the "exclusive". The first example was the "exclusive" interview with Lord Minto, the new Viceroy of India. This approach was popular and later that year the circulation of the newspaper had reached 350,000. Despite the success of the Daily Mirror, Alfred Harmsworth was more interested in his other newspapers, The Times and the Daily Mail. In January 1914 he sold the newspaper to his brother, Harold Harmsworth, now Lord Rothermere. In the First World War the Daily Mirror became the most popular newspaper on the Western Front. The soldiers particularly liked the fact that the newspaper included so many pictures of life back home. The newspaper also published pictures of the war. Probably the most dramatic example was the German daylight air raid over London in 1917. Lord Rothermere disposed of his shares in the Daily Mirror in 1931. By this time the circulation of the newspaper had reached 800,000. Whereas Rothermere's newspapers, the Daily Mail and the Evening News, gave support to Hitler, Mussolini and Oswald Mosley, the Daily Mirror, under the editorial director, H. G. Bartholomew, moved the newspaper to the left. Richard Jennings, deeply influenced by the ideas of William Morris, was employed to write the editorials. Jennings took a keen interest in foreign affairs and his lucid editorials helped to explain to the readers the dangers being posed by Hitler's regime. On the advice of Cecil King, the advertising director, H. G. Bartholomew, decided to make the Daily Mirror a tabloid newspaper. Batholomew, who hated the arrogance and snobbery of the upper classes, encouraged the editorial staff to develop an anti-establishment tone. Batholomew also employed radical journalists such as Hugh Cudlipp and William Connor, who wrote under the name of Cassandra. According to Connor's biographer, John Beavan: "Bartholomew asked Connor to try his hand at a column.... The column appeared two or three times a week as and when there was room. Connor soon showed a talent for robust invective... The column varied. It could contain hard-hitting political comment, attacks on government departments and individuals, lavish praise of individuals, and dithyrambic essays on cats or on homely dishes such as cabbage and herring cooked in a particular way. Whatever it was, it was always Connor and it had a tremendous audience." When Germany and Italy gave support to Franco during the Spanish Civil War, the Daily Mirror began a campaign for Britain to increase defence spending. Stanley Baldwin was attacked for his complacency and Winston Churchill was praised for his calls for the government to rearm. Whereas newspapers such as the Daily Mail and the Evening News had given support to the right-wing governments in Germany, Italy and Spain, the Daily Mirror consistently exposed the image of a harmless Hitler put out by some newspapers sympathetic to fascism. In July 1938 Hugh Cudlipp and Cecil King visited Winston Churchill at his home in Kent when together they planned the attack on Neville Chamberlain and his policy of appeasement. 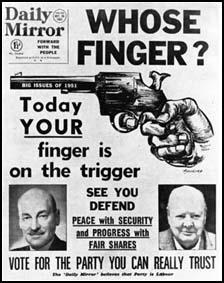 The result was a series of articles by Churchill that appeared in the the Daily Mirror during the following month. In one article Churchill warned that the "unaccountable delay - whoever is to blame for it - in concluding an all-in alliance between Britain, France and Russia, increases the danger of a wrong decision by Herr Hitler." William Connor held left-wing political opinions and was a strong opponent of fascism. After visiting Nazi Germany he wrote about the dangers of Adolf Hitler: "Before this visit to Germany I always had a sneaking feeling that there was a strong undercurrent of opposition to Hitler. I am now certain that I was wrong. I now know that this man has the absolute unswerving confidence of the people. They will do anything for him. They worship him. They regard him as a god. Do not let us deceive ourselves in this country that Hitler may be dislodged by enemies within his own frontiers." Connor wrote in the Daily Mirror on 21st March, 1939: "There are two ways of losing a war. One is to be defeated in the field. The other is to lose the war before it begins. We have indicated this peril for months past. It is now obvious. It has to be admitted. Why is so plain a peril - plainly revealed in Hitler's book - why, we ask, is it only now recognised by our rulers? Simply because, even if they have read Hitler (which is still doubtful) they have not believed what he has said in Mein Kampf. Not believing him, not knowing the sort of lucid lunatic with whom they have had to deal, they have believed it possible to disarm him by smiles, handshakes, pacts and scraps of paper." Soon after the outbreak of the Second World War, the recently employed journalist, William Connor, introduced the cartoonist, Philip Zec, to H. G. Bartholomew and Cecil Thomas, the editor of the Daily Mirror. Bartholomew liked Zec's work and commissioned him to do a daily cartoon. Zec's cartoons were an immediate success with the readers. Zec, who was Jewish, felt passionately about the need to defeat Hitler, produced a series of powerful cartoons on the war. Donald Zec pointed out: "He (Philip Zec) presented Hitler, Goering, and others in the Nazi hierarchy as strutting buffoons. Replacing ridicule with venom, he often drew them in the form of snakes, vultures, toads, or monkeys." When Hitler heard about these attacks on his regime, he added Zec's name to the Nazi Black List of people to be executed after Britain's defeat. Winston Churchill believed that the cartoon suggested that the sailor's life had been put at stake to enhance the profits of the petrol companies. In the House of Commons, Herbert Morrison, the Home Secretary, called it a "wicked cartoon" and Ernest Bevin, the Minister of Labour, argued that Zec's work was lowering the morale of the armed forces and the general public. Churchill arranged for MI5 to investigate Zec's background, and although they reported back that he held left-wing opinions, there was no evidence of him being involved in subversive activities. H. G. Bartholomew and Cecil Thomas were ordered to appear before Morrison at the Home Office. Zec's cartoon was described as "worthy of Goebbels at his best" and turning on Thomas, Morrison told him that "only a very unpatriotic editor could pass it for publication". Morrison informed Bartholomew that "only a fool or someone with a diseased mind could be responsible" for allowing the Daily Mirror to publish such material. When Anueurin Bevan heard that the government was considering closing down the Daily Mirror he forced a debate on the issue in the House of Commons. Some MPs were appalled when Herbert Morrison suggested that the newspaper might be part of a fascist plot to undermine the British Government. Several pointed out that the Daily Mirror had been campaigning against fascism in Europe since the early 1930s. Bevan argued in the debate that: "The Government are seeking to suppress their critics. The only way for the Government to meet their critics is to redress the wrongs from which the people are suffering and to put their policy right." On V.E. Day Donald Zec produced the extremely powerful cartoon, Here you are! Don't lose it again. The same cartoon was used on the front page of the Daily Mirror on the morning of the 1945 General Election. Next to the cartoon the text suggested that the best way to preserve peace was to vote for the Labour Party. After the war Hugh Cudlipp returned to the Sunday Pictorial, but was sacked after a dispute with H. G. Bartholomew in December, 1948. Lord Beaverbrook, had been waiting for this opportunity and promptly employed Cudlipp on the Sunday Express. Cecil King was furious when he heard the news, and he joined up with fellow director, Philip Zec, to remove Bartholomew as editorial director. Soon afterwards, Cudlipp was brought back as editor of the Sunday Pictorial, and later as editorial director of the Daily Mirror Newspapers Group. Cudlipp and King ensured that the Daily Mirror remained a loyal supporter of the Labour Party. Now established as the newspaper of the working-classes it became Britain's best-selling newspaper and on the morning of the Queen Elizabeth's coronation in 1953, sold over seven million copies. In the 1950s Cecil Thomas, the editor of the Daily Mirror, and William Connor, led a passionate campaign against capital punishment. This was a brave policy as at that time the vast majority of the British public was in favour of hanging. Cecil King, the managing director of the newspaper did not agree with Thomas and Connor on this issue: "I personally didn't agree with the End Hanging campaign of the Mirror, but I allowed the overwhelming consensus of office opinion to prevail." During the investigations of Royal Commission on the Press in June, 1961, Cecil King admitted that Cudlipp and himself decided the editorial strategy of the Mirror Group. Cudlipp added that: "Mr. King and I meet frequently; we know each other's minds and the policies of our papers have been settled for many years." According to Cudlipp this did not restrict the freedom of more left-wing members of staff such as Cassandra and Vicky. "When Vicky drew cartoons for us, I can't remember a single occasion on which he agreed with the policy of the paper, and Cassandra, might be miles away from it, but both are given freedom of action." Came down to the Mirror office and found Kennedy Jones in full swing, and after the usual pangs of childbirth produced the first copy at 9.50 p.m. It looks a promising child, but time will tell if we are on a winner or not. Owing to much good luck and many loyal co-workers, the Daily Mirror is, up to the present, the only journalistic failure with which I have been associated. Disaster may often be changed to triumph by alteration in tactics. The faculty of knowing when you are beaten is much more valuable than the faculty of thinking you are not beaten when you are. I had for many years a theory that a daily newspaper for women was in urgent request, and I started one. The belief cost me £100,000. I found out that I was beaten. Women don't want a daily paper of their own. It was another instance of the failures made by a mere man in diagnosing women's needs. Some people say that a woman never really knows what she wants. It is certain she knew what she didn't want. She didn't want the Daily Mirror. I then changed the price to a halfpenny, and filled it full of photographs and pictures to see how that would do. It did. (3) In November 1903, Alfred Harmsworth invited Henry Hamilton Fyfe to meet him at Carmelite House. Fyfe recalled the meeting in his book My Seven Selves. I was shown into a small room where an extremely pretty girl sat typing letters. Then I saw that in the doorway stood a youngish man, rather heavily built, with fair hair that swept in a wave over his forehead, massive features, penetrating blue eyes. just now his eyes were smiling. "Come in," he said, his tone was friendly. For a few minutes we talked about the Advertiser. He seemed to know that I had little money to spend, that my relations with the Board was strained. After this he looked hard at me. "How would you like to come on to one of my papers?" he asked. Suppressing an impulse to take his hands, lift him out of his chair, and whirl him in a wild dance round the room, I said quietly: "That depends on what arrangement we could make." He pressed a bell. A small boy in uniform appeared. "Ask Mr. Kennedy Jones to come down for a moment," Harmsworth said. We went on talking, and I succumbed at once to the fascination he was to exercise over me for nearly twenty years. Kennedy Jones came in. A totally different type of man, no charm of manner or expression - until he smiled. Coarsely moulded features, stiff black hair, rather a lazy way of moving, but a man who directly he spoke radiated acute intelligence. He shook hands in an uninterested sort of way, and sprawled on the Chesterfield lounge. Harmsworth frowned. "I want somebody to take over the Daily Mirror," he said, and showed that he had to make an effort to say it. His failure, the first bad one he had known, hurt him. "It won't do as a paper for women," Harmsworth went on. "It's taught me two things - that women can't write and don't want to read. But we've got to do something with it. I should like to see what you can do." (4) In his book My Seven Selves, Henry Hamilton Fyfe explained how he changed the Daily Mirror. As for the women, I had the very disagreeable duty of sending them away with three months' wages "in view of the changes about to be made in the paper." What these changes were to be nobody knew. The women asked me. I could not tell them. They begged to be allowed to stay. They left little presents on my desk. They waylaid me tearfully in the corridors. It was a horrid experience - like drowning kittens. One day the Chief (Harmsworth) sent over to me a man (Arkas Sapt) on the magazine side of his business, with a note saying that he was probably mad, but that I might listen to what he wanted to tell me. I listened. He told me he could print photographs from half-tone blocks on quick-printing rotary machines. No newspaper up to that date had been regularly illustrated in this way. Photographs were always copied in pencil or pen and ink, and printed from line blocks. A paper that could reproduce photographs directly would be a novelty with an immediate and compelling appeal. I formed the opinion that this man was certainly not mad, though perhaps eccentric, and that what he had discovered might, if it satisfied our tests, make the fortune of the Daily Mirror. I was right. It did. 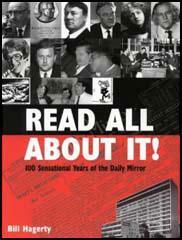 (5) In his book My Seven Selves, Henry Hamilton Fyfe explained the success of the Daily Mirror. The shape and content of the Daily Mirror recommended it strongly to those who needed something to help them through their half-hour's journey to work in the morning. Packed in tram, train, or omnibus, standing up perhaps and holding on to a strap with one hand, they required in the other, not a journal to stir thought or supply serious information, but one to entertain them, occupy their minds pleasantly, prevent then for thinking. It was easier to look at pictures than to read print. The news was displayed and worded in a manner that made assimilation simple. Everything in the Daily Mirror was calculated to be easy of absorption by the most ordinary intelligence. Before this visit to Germany I always had a sneaking feeling that there was a strong undercurrent of opposition to Hitler. I am now certain that I was wrong. I now know that this man has the absolute unswerving confidence of the people. They will do anything for him. They regard him as a god. Do not let us deceive ourselves in this country that Hitler may be dislodged by enemies within his own frontiers. There are two ways of losing a war. One is to be defeated in the field. The other is to lose the war before it begins. We have indicated this peril for months past. It is now obvious. It has to be admitted. Why is so plain a peril - plainly revealed in Hitler's book - why, we ask, is it only now recognised by our rulers? Simply because, even if they have read Hitler (which is still doubtful) they have not believed what he has said in Mein Kampf. Not believing him, not knowing the sort of lucid lunatic with whom they have had to deal, they have believed it possible to disarm him by smiles, handshakes, pacts and scraps of paper. Hitler is never satisfied with submission. His "dark Satanic mind" rejoices in humiliating the downfallen. He stamps on the faces of his victims. We know his methods and have studied his programme. Nothing that he does surprises us. What does surprise us is the surprise of our rulers here. They never seem to suspect their Hitler. When he lets them down, they just can't make out what's come over the Fuehrer. Why, he promised to be good! (9) When it became known that Herbert Morrison had threaten to ban the Daily Mirror over its publication of Philip Zec's cartoon on the price of petrol, some members of the House of Commons forced a debate on the issue. Morrison tried to explain his actions in the debate that took place on 26th March, 1942. Supposing a secret Fascist organization wished to conduct propaganda for the purpose of undermining morale. If it had sense, it would not go about it by openly opposing the war. Not at all. It would set about vigorously supporting the war and then it would paint the picture that the House of Commons is rotten or corrupt or incompetent or something like that, that the Government is the same, that the chiefs of the Armed Forces are the same, in that way effecting a steady undermining of public confidence and a spread of the belief that defeat is inevitable and why should the needless spilling of blood and suffering continue. That would be a perfectly understandable Fascist technique. (10) In March 1942 the Home Secretary, Herbert Morrison, threatened to ban the Daily Mirror after it published a cartoon by Philip Zec that criticised war profiteering. In the House of Commons Bevan defended Zec's cartoon. I do not like the Daily Mirror and I have never liked it. I do not see it very often. I do not like that form of journalism. I do not like the strip-tease artists. If the Daily Mirror depended upon my purchasing it, it would never be sold. But the Daily Mirror has not been warned because people do not like that kind of journalism. It is not because the Home Secretary is aesthetically repelled by it that he warns it. I have heard a number of honourable members say that it is a hateful paper, a tabloid paper, a hysterical paper, a sensational paper, and that they do not like it. I am sure the Home Secretary does not take that view. He likes the paper. He is taking its money (waves cuttings of articles written by Morrison for the Daily Mirror). He (Morrison) is the wrong man to be Home Secretary. He has for many years the witch-finder of the Labour Party. He has been the smeller-out of evil spirits in the Labour Party for years. He built up his reputation by selecting people in the Labour Party for expulsion and suppression. He is not a man to be entrusted with these powers because, however suave his utterance, his spirit is really intolerant. I say with all seriousness and earnestness that I am deeply ashamed that a member of the Labour Party should be an instrument of this sort of thing. How can we call on the people of this country and speak about liberty if the Government are doing all they can to undermine it? The Government are seeking to suppress their critics. The only way for the Government to meet their critics is to redress the wrongs from which the people are suffering and to put their policy right. The Daily Mirror belonged originally to Lord Rothermere. About ten years ago, Lord Rothermere sold his shares, gradually, on the Stock Exchange. They were brought up in small blocks. There is no big, or controlling, group of shares now held by one person. The shares held by nominees represent only between five and ten per cent of the whole shareholding of the paper. In other words, this paper, unlike many others, is run by a board of directors and a chairman. The Daily Mirror has not changed (its policy) in the last five or six years. Its staff has not changed, since the time when the Prime Minister wrote for it. (12) On 26th June 1961, Cecil King was interviewed by the Royal Commission on the Press on how editorial policy of the Daily Mirror was decided. I would say that on editorial policy Hugh Cudlipp and I, who have been directors together for very many years, work closely and are in general agreement on what sort of line we are going to take. I suppose I see him very nearly every day, and if anything fresh crops up we decide what we are going to do, but I very rarely see the editors. He sees the editors and the editors are responsible to him. (13) On 26th June 1961, Hugh Cudlipp was interviewed by the Royal Commission on the Press on how editorial policy of the Daily Mirror was decided. Mr. King and I meet frequently; we know each other's minds and the policies of our papers have been settled for very many years; we're not suddenly going to be Right wing instead of Left Wing, or unilateralists instead of multilateralists. When Vicky drew cartoons for us, I can't remember a single occasion on which he agreed with the policy of the paper, and Cassandra, might be miles away from it, but both are given freedom of action.